Fireball was the first German search engine that was developed in 1996 by the Department of Computer Science of the Technical University of Berlin (TUB) under the working title "Flipper". In 1997 it was further developed by Gruner + Jahr, the project group KIT (TUB) and Neofonie GmbH. The search engine was renamed "Kitty". 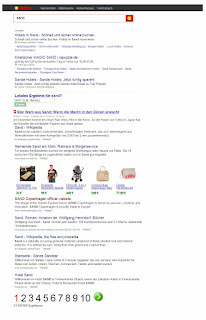 In June 1997 the search engine started as "Fireball" with a robot called "Kit-Fireball". Then in 1998 Fireball started a collaboration with AltaVista to offer a global search. In 1999 Lycos Europe bought Fireball. 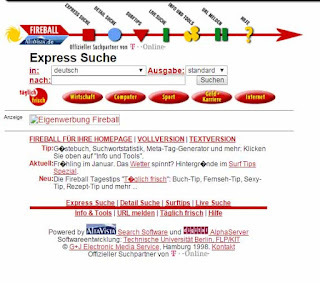 In early 2000, Fireball was the largest German search engine with 13.5 million websites, 68.7 million page views and 14 million unique visitors. In August 2000, Fireball held a volume of 22% of the German search engine market. From 2003 to 2008 Fireball used Yahoo and from 2008 to 2009 Google. 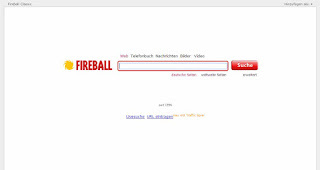 In March 2009 Fireball was sold to the Swiss Ambrosia AG and they start using Fireball's own search engine again. In 2010, Fireball optimized the site for mobile devices, but it did not offer a mobile site or app.